A very fortunate coincidence occurred recently. This post popped up in my Google Reader. I was so surprised, and actually demanded to know if Lindsay had broken into my house and peeked in my refrigerator. You see, never in my life have I ever seen fresh figs in the grocery store. If they were there, I didn’t notice them. The past year or so I’ve been intrigued by them after enjoying fresh figs, or fig jam on dishes while dining out. On a recent grocery trip to Harris Teeter I saw them, and on a whim, bought two, not knowing what I was going to do with them. Also, the past month or so I keep meaning to purchase some of the locally produced fresh goat cheese I’ve seen at the farmer’s markets I visit. But, due to me being ME, I either don’t have enough cash, don’t have ANY cash, or have the cash, but forgot my wallet. This past weekend, I made an extra effort to pick some up. This goat cheese is produced on a farm in Franklin, TN. According to this article in the Tennessean the cheesemaking seems to be a fairly new venture for the company, Noble Springs Farm. As you know if you read my blog even sporadically, I’m a member of a CSA. I love supporting local producers, and small businesses. I believe that when you do that, you are helping not just that business but the community as well. That was part of the reason I chose to purchase the goat cheese. But I’ll be honest, the other reason is because it’s so delicious! Even when I knew I didn’t have cash to purchase some, I *might* have wandered over for a sample, a time or two (or three). They produce a couple varieties including this peppercorn, and a cherry berry, just to name a few. I had just so happened to purchase the peppered goat cheese. So THAT was why I thought Lindsay’s post was truly serendipitous! Nashvillians, if you are interested in the goat cheese I know for sure they sell it at the East Nashville Farmer’s Market (Wednesdays), as well as the new West Nashville Farmer’s Market (Saturdays on 46th & Charlotte). Perfect. That’s really the best way to describe this. The only way I think I could have made it better, would be if I was able to use locally produced honey. If you’ve never had fresh figs (and I hadn’t until recently), they are similar to a plum or peach in exterior texture, and they are soft with almost pulp-like sacs similar to an orange. 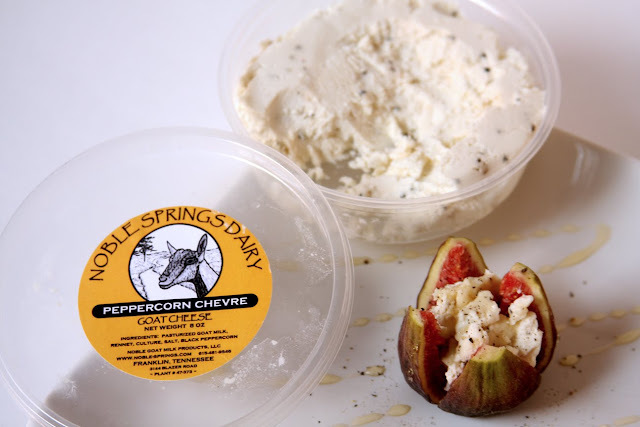 When paired with the goat cheese and honey, you get some sweetness from the fruit, with a touch of the richness of the goat cheese, a different kind of sweetness from the honey, and of course the honey & pepper. I don’t think there’s anything I’ve prepared that felt so simple and yet fancy at the same time. I wasn’t surprised to discover the recipe came from Bon Appetit. The recipe really defines the kinds of food I like to eat; simple with a touch of elegance, in season, and course, utilizing local ingredients. I can’t wait for an event I could serve these at as appetizers! PS. I would like to add, just to be clear, no one paid me to go on & on about how great this goat cheese is, and I didn’t get it for free. I just like to write about food discoveries I love. Starting at stem end, cut each fig into quarters, stopping 1/2 inch from bottom to leave base intact. Gently press figs open. Spoon 1 teaspoon cheese into center of each. 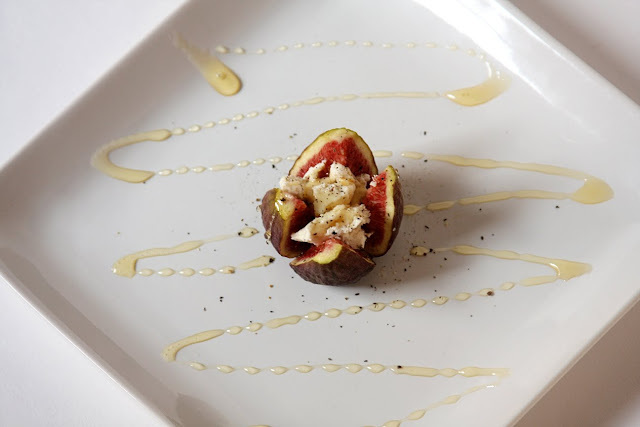 Arrange figs on platter; drizzle with honey, then using pepper grinder, crack pepper over fig. This time last year I posted this Layered Pumpkin Loaf, which was moist & delicious! I am SO sad I'm missing fresh fig season this year. We had a tree in our front yard in California, and I got incredibly spoiled. Eat lots and lots of these for me, and know that I'm INCREDIBLY jealous of your fridge full of figs and cheese! What I think is truly so crazy about this is that I made this same thing just a couple of weeks ago and didn't mention it to you or Lindsay. 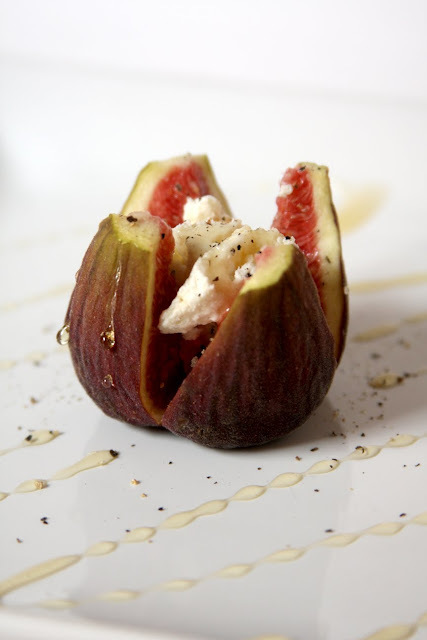 I too had never purchased figs until then, and didn't even have a recipe- just threw it all together- JUST LIKE THIS! Great minds think alike. Oh, but my goat cheese was from Kira's Kids Dairies- they sell at the Nashville Farmers' Market. Yummy stuff! I really need to start working with figs and learning more about them. And with goat cheese?! yum! Oh my goodness, this looks sooooo delicious! I love figs!! I've never had them with goat cheese; this is something I def need to try. 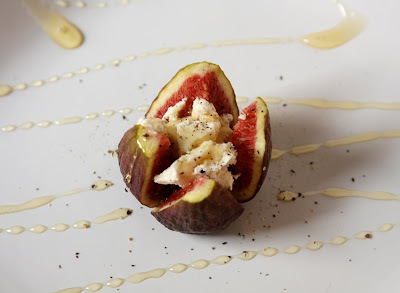 Mmm that goat cheese sounds delicious and I LOVE figs with goat cheese. Pretty presentation, too! These look divine!!! !Think I've found my appetizer for next week's family get together!